I work for and/or own a business entity in Texas whose primary business is the application, installation and/or repair of roofs. I have pursued this endeavor for at least 2 years in North Texas. I am in good standing with the Better Business Bureau (BBB). My company holds and maintains General Liability Insurance. If the State of Texas enacts a licensing requirement, I understand that membership in NTRCA requires that I comply with licensing requirements in accordance with state guidelines. I agree to abide by the NTRCA Code of Ethics. Need to know whether you need roof repairs, and if so, the cost? 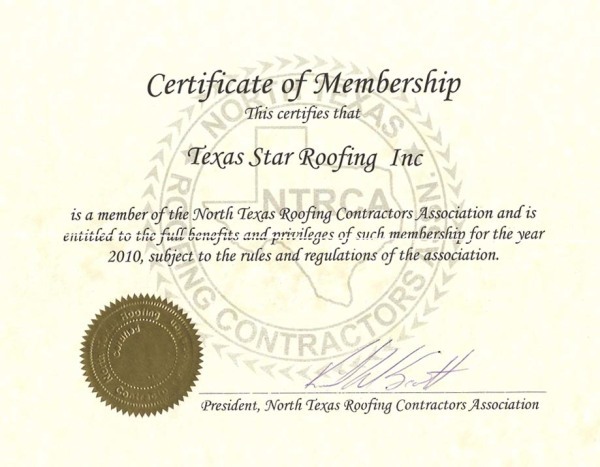 We offer free roofing inspections in the DFW area. To request yours just complete the form today!